Incorporate gamification and engagement mechanics into your Salesforce.com site. "Salesforce", "Enterprise Gamification", "Employee Engagement"
RedCritter for Salesforce allows employees to surface their accomplishments. 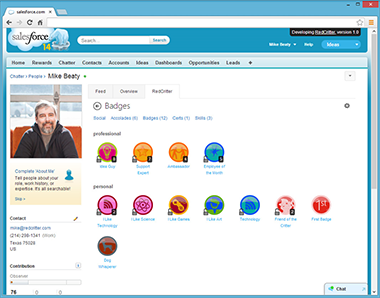 Embed badges, certs, skills, accolades and social links in your Salesforce profile. Run your own company rewards store and issue virtual currency based on actions users take in Salesforce. Allow employees to publish their accomplishments to their Chatter feed. Finally you have the tools you need to increase, measure and manage employee engagement within Salesforce. With RedCritter users can be on-boarded more easily and fully engaged to ensure maximum productivity. Your developers can use our native Salesforce APEX APIs and easily call our gamification APIs to award badges, certs, skill points and even virtual currency automatically based on actions within Salesforce. RedCritter enhances your Salesforce.com employee profiles, allowing your team to highlight their accomplishments and skills. Employees can give co-workers accolades directly from within their team member's profile. We also add badges, certs, skills and social links. An internal reward store is a great way to recognize top performers, drive strategic initiatives, and offer creative perks to your team. 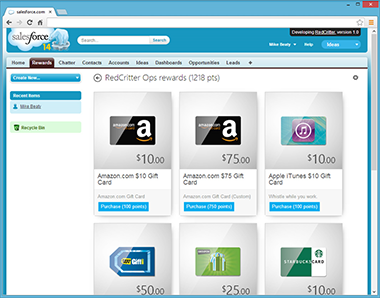 RedCritter gives you a reward and recognition platform that automates your entire employee rewards program – from issuing “points” to rewards fulfillment. RedCritter also works with your Salesforce Chatter feed. Employees can opt-in to publish their accomplishments in real-time to your feed.